Isabelle Thomas-Fogiel, trad. Richard A. Lynch, Columbia University Press, New York and Chichester, 2011. Many philosophers have heralded the death of philosophy. Kant claimed responsibility for both its beginning and end, while Heidegger argued it concluded with Nietzsche. In the twentieth century, figures as diverse as John Austin and Richard Rorty have proclaimed philosophy's end, with some even calling for the advent of "postphilosophy." Transcending the analytical and continental divide, the death of philosophy is a topic as debated as the death of God. In an effort to make sense of all these conflicting positions-which often say as much about the philosopher as the subject itself-Isabelle Thomas-Fogiel offers the first systematic treatment of "the end of philosophy" and, in the process, recasts the history of western thought. Thomas-Fogiel begins with postphilosophical claims such as scientism, which, by subsuming philosophy into the branches of the natural sciences, she reveals to be self-refuting. She discovers similar issues in Rorty's skepticism and strands of continental thought. 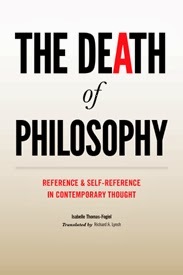 Revisiting the work of late-nineteenth and early-twentieth-century philosophers, when the split between analytical and continental philosophy began, Thomas-Fogiel finds both traditions followed the same path—the road of reference—which ultimately led to self-contradiction. This phenomenon, whether valorized or condemned, has been understood as the death of philosophy. Tracing this pattern from Quine to Rorty, from Heidegger to Levinas and Habermas, Thomas-Fogiel reveals the self-contradiction at the core of their claims while also divining a new path through self-reference that breathes much-needed life into the discipline. Trained under the French philosopher Bernard Bourgeois and a major, upcoming scholar in the field, Thomas-Fogiel remakes philosophy in exciting ways for the next century.